Silica Gel can adsorb up to 40% of its weight in moisture and has the highest absorption capacity of any commercially used desiccant. This is Non-Indicating Silica Gel. 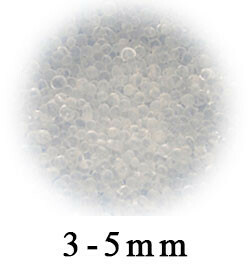 White Non-Indicating Silica Gel Beads - Bead Size 3-5mm - Sold By The Pound! Silica Gel can adsorb up to 40% of its weight in moisture and has the highest absorption capacity of any commercially used desiccant. This is Non-Indicating Silica Gel which can be reactivated by placing in an oven on an safe sheet for up to 3 hours at 250 degrees F.
Free USPS Parcel Post shipping within the USA! We also offer expedited USPS Priority, USPS Express, and FEDEX services during checkout!